Nobody prays for it, but accidents do happen, and when they do, having a car escape tool can mean the difference between life and death. It's also not just about you and your car occupants, you could happen upon an accident scene with lives at stake, where you could offer a helping hand with your car escape tool and save a life or two. In this car escape tools review, we'll take a look at the different offers in the market and additionally consider a few factors that are necessary when making a choice. 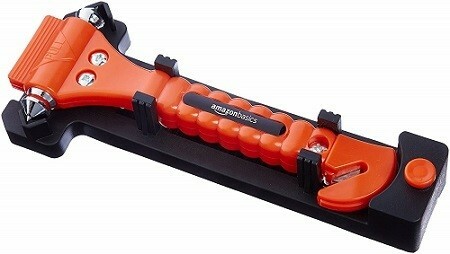 Stander's HandyBar is a 3-in-1 automotive tool that combines a standing aid with a seatbelt cutter and a window breaker. It's simple, easy to use, and works in any vehicle with a door striker/latch system. Simply insert the metallic tip into your car's U-shaped door striker and use it to leverage sitting down and standing up. It's a great tool for the elderly and for those with certain difficulties, but it has a 350-pound weight capacity. Of course, it integrates a seatbelt cutter in its handle and the metal tip doubles as a manual glass breaker. The handle is ergonomically designed and offers a non-slip grip. The best part of this offer, however, is that Stander offers a lifetime guarantee on it, so there's absolutely nothing to worry about. If you prefer a car escape tool that you can easily attach to your key-chain, then check out this offer from Resqme, a Red Dot Design Award winner that's been saving lives for over 10 years. The design is simple and only includes a window breaker and a belt cutter. There are no other features, except a hook for key-chain attachment. You should keep in mind that it's compact and measures just 4 inches in length, so some people may have difficulties handling it properly. You'll also need to buy its premium pack separately if you want to use accessories like a lanyard, cable tie, and keyring. 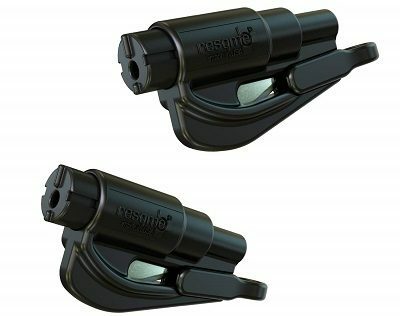 On the brighter side, this offer is for two pieces of the compact Resqme car escape tool with spring-assisted glass breaker, and they come backed by a 1-year warranty. Here comes the original and the best automobile escape tool since 1982. It's made in the Netherlands and certified by the respected German TÜV with a GS certificate. This safety hammer has been a top seller for many decades because of its simple and efficient design. It comes with a mounting bracket, so you can put it anywhere in the car and its long handle offers plenty of leverage. You get a very sharp seatbelt cutter and a double-sided steel hammerhead. Although this offer is for the original orange version, you can also choose pink, or glow in the dark versions, as well. One peculiarity of this car escape tool is that Lifehammer offers absolutely no warranty on it. Maybe it's because a GS certificate from TÜV is enough. The Ingear AutoXscape takes a different approach from other car escape tools in its design. It features two glass breakers, a seatbelt cutter, and a 135-Lumen torchlight. These features combine to make it one of the best emergency car escape tools in the market, and Ingear even goes ahead to offer a lifetime warranty coverage on it. The package includes a super-strong adhesive mount, which allows you to mount it anywhere in your vehicle. One window breaker is of hardened steel, while the major one, which you must remove the cap to see, is from tungsten steel, and guaranteed to shatter any tempered glass. The body gets constructed using military-grade aluminum and includes a textured rubber knurling for optimal grip. The torch offers three modes, including high, low, and SOS. For those on a budget or who simply love low prices, AmazonBasics offers you the best car escape tool at the best price. It's designed like the famous Lifehammer Original emergency tool but it has a narrower handle. Still, it spots two hammers as well, and both are of tungsten steel. The package includes an installation bracket just like the Original, and this lets you install and store the tool in the best place inside your car for an easy reach. 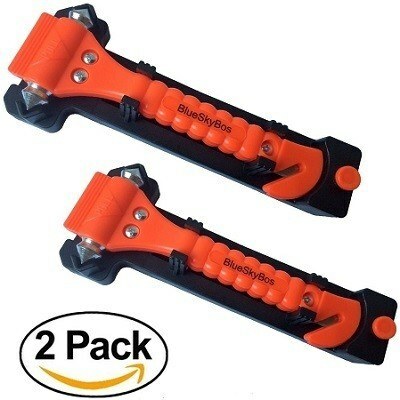 It comes with the same bright orange handle and seatbelt cutter, but while Lifehammer offers no warranty, AmazonBasics offers a 1-year warranty on this one, and at such an attractive price. 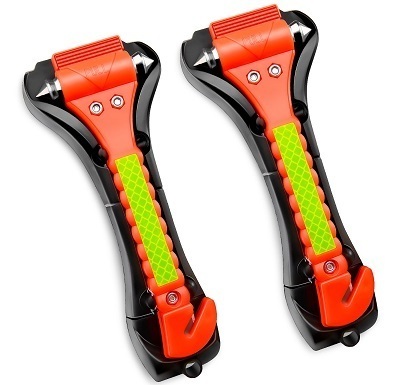 Here's another car escape tool that looks just like he Lifehammer double-hammer tool. This one comes from BlueSkyBos and the package has two pieces inside. Given the low price of this offer, this puts each escape tool in this package at a very low price below $5. Each one is also 7.5 inches long and comes with an installation bracket. 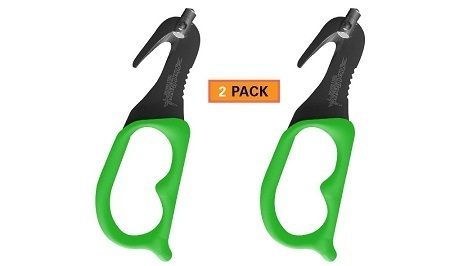 Although there are two similar hammerheads for shattering glass in each tool, they're not spring assisted, and it would be great if these tools also worked as a handle for getting in and out of the car. Still, they make perfect gifts for friends and family members with their easy to use design and low price, plus they are also backed by lifetime warranties. Also featuring the same design as the previous two car escape tools is this offer from Gooacc. 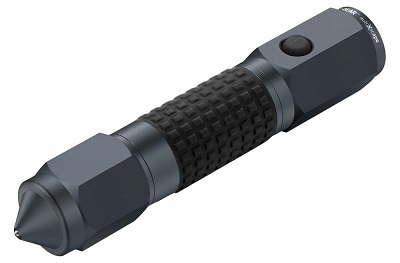 It has an extra reflective strip on the handle, which makes it easy to find in the dark or in an emergency. The tool comes with the same double hammerhead as the others, and these are from hardened steel. Its blade is also razor-sharp, guaranteeing quick seatbelt cuts every time. One major difference in this car escape tool is its mounting base, which fits the tool snuggly and makes it easy to install. Although there are two pieces in this set and the price is good, you can still get a better price elsewhere. Gooacc also provides no warranty information but the orange color and reflective strip combination is a big plus. 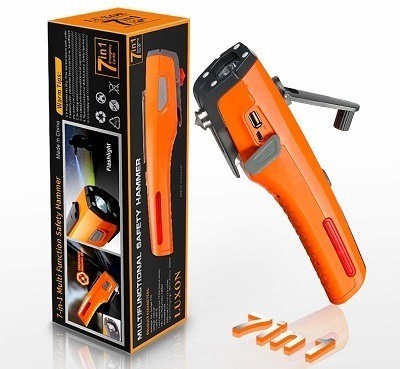 This Ztylus car escape tool takes a different approach from other designs by combining the hammer breaker and seatbelt cutter with a USB charger. The charger plugs into the cigarette lighter socket of your car and offers two USB power ports with a 2.4-Amp output for charging your mobile devices. 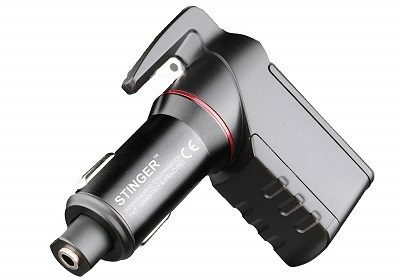 Using this device as a charger keeps it always within reach, so you don't need to install it someplace else in your car because the cigarette lighter socket is always positioned conveniently. Having a spring-loaded glass breaker is a big plus, but the seat belt cutter has no cover for its sharp blade when in use as a charger. Ztylus offers a 1-year warranty on the device but you need to register it first to receive this warranty. This Luxon 7-in-1 emergency kit is a complete package that includes everything possible to offer you the best help in times of emergency. It comes with a rechargeable battery, which you can either recharge through USB or per hand-crank. There is a corrosion-resistant and extra-hard window breaker, a seatbelt cutter, and a magnet to stick this tool on your car and turn on the emergency lighting. Other features include the flashlight made using LEDs, the 1-year warranty coverage from Luxon, and the package includes the necessary cables. One minus point is that this device is not waterproof, but it does include a large 2,600 mAh battery, which can work great as an emergency power bank for your mobile devices. This offer features one of the best car escape tools simply because of its unique design. StatGear makes it easy to store safely and to get access to in times of need. The package includes a storage sheath that installs into your vehicle's sun visor and then, this escape tool simply slides into it. In addition to its unique design, this package includes 2 pieces of this tool, so you can either give someone a gift or install it in your second visor or car. They are also available in different colors, allowing you to choose what your heart desires. Things that you might not like include that StatGear only offers a 90-day warranty on the package and that there's no spring-assisted glass breaking. It's however, a great emergency tool with a great design. How about a single tool that can become an indispensable tool in your car? This offer from Lantoo is exactly such a tool. It comes with five different features that make it the ultimate car emergency device. 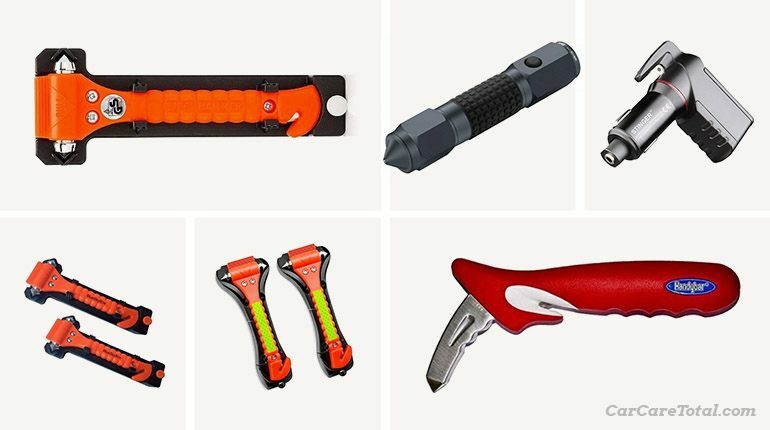 It has a window breaker with a nice grip handle, a built-in seatbelt cutter, a Led flashlight for emergency uses at night, and a red light for more visibility and other safety uses. 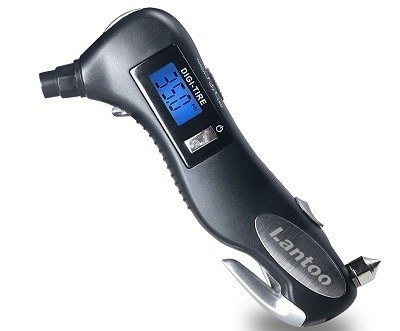 This device also includes a 150-PSI tire gauge with a digital display, making it one of the best car window breakers ever, because all these functions combine to make it an indispensable automotive tool. The package doesn't include any installation device or plans, so it's left for you to find some space for it somewhere inside your car. You also need to take care while using it because the seatbelt cutter is a little exposed. On the bright side, it's very affordable. Here's another 5-in-1 emergency device but this one is more compact and doesn't include a tire pressure gauge. The offer is also for a pack of two of the devices. Each one feature a spring-assisted glass breaker and a seatbelt cutter that's protected by a guard when not in use. Other features include a very loud sonic alarm, an emergency flasher, and a LED flashlight. You can either choose to add it to your car's keychain or secure it in your sun visor. 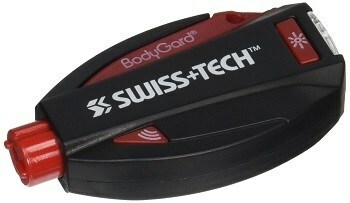 Swiss+Tech is so sure of its high quality that it backs it with a lifetime warranty. This list of the top car escape tools above may not mean much without a buying guide that shows you the important aspects to look at and to consider before making a choice. There are two basic features that every car escape tool should try to include and these are a window glass-breaker and a seat belt cutter. Glass-Breakers. Glass-breakers make it easy to crack the side windows of a car in the case of an emergency, such as when getting submerged in water. This is necessary because car doors are difficult to open underwater, unless the car fills up with water, in which case it's usually too late. There are two types of glass-breakers in the market and they are manual glass-breakers and spring-assisted glass-breakers. With the manual type, you have to hold it firmly in your fist and hit the glass with a fast and hard punch to crack it. With spring-assisted glass-breaker, however, you don't need any force to crack your car's window. Simply hold it against the glass and activate the release mechanism. They are the best tools to break car windows. Seatbelt Cutters. Although seatbelts are there to keep you safe in the case of an impact, they can become an obstacle to your safety if the belt won't release and you need to get away from the vehicle as quickly as possible. With a seatbelt cutter, all you need is to pull the seatbelt slightly away from you, make sure that it's taut, and then pull the cutter through it, and you should become free. In addition to the two basic features of a seatbelt cutter and a glass-breaker, a car escape tool can come with as many extra features as the manufacturer is capable of adding. Popular extra features include a flashlight, a USB port or charger, a compass, a magnetic base, and a key-chain. None of these features is better than the other, so it's left for you to choose an offer that comes with the right extra features for you. This is another option that's left for you to decide what you want. Do you want a single tool that comes with every possible feature, or do you prefer a simple tool that comes with just the basics? By answering this question, you'll get better focused on what you need. Most car escape tools come at affordable prices, but some still cost more than others. Some are also better built and come with longer warranties, but often at a higher price. Since you're the only one here that really knows how much you're willing to spend, it's therefore, left for you to choose an offer with a price and quality that you can live with. The simple truth is that you'll be using your car escape tool only in an emergency, so it needs to work flawlessly and you need to know how to use it with ease. So, look well and make sure that it's a tool that you are comfortable with and that you can work well with, before deciding on it. We've reached the end of this car escape tools review and you've seen the different offers in the market, from the simple and manual hammers up to digital devices with lots of other features. With all this variety, you'll understand that there's no product that's better than the rest because we all have slightly different preferences. It's therefore left for you to choose which car escape tool best suits your needs.